Disney World! Mickey's Pool-side Get-away! Private Home, Low $'s! NEW, spectacular 3 bedroom / 2 bath home with a heated pool right outside your door! And just 5 minutes from Disney World! This is a 5-star, spacious, newly designed and furnished home! 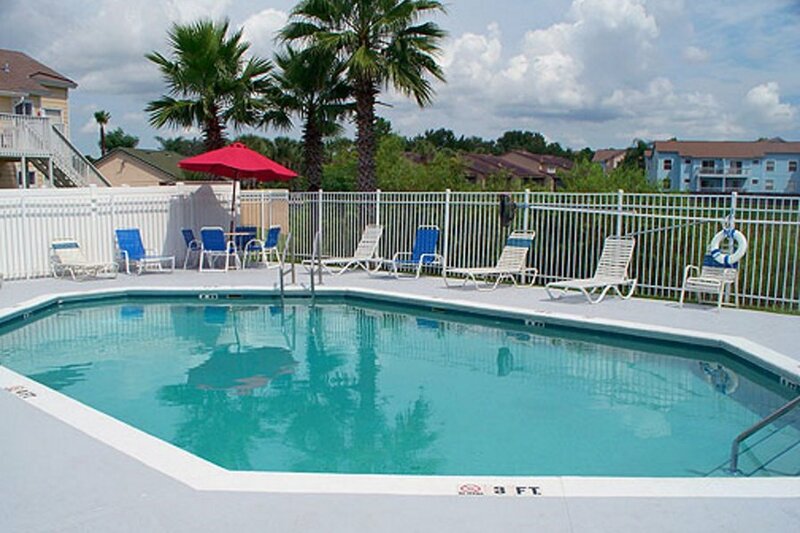 Why spend $400-$500 per night or more staying "on property" in nothing more than a glorified hotel room when you can enjoy a SPACIOUS, NEW, FULLY FURNISHED resort condo for so much less - and still be just 5 minutes from Disney World and only 15 minutes from Universal and Harry Potter? And if you're "snowbirds" looking for the perfect Florida winter vacation home, look no further! This is a GROUND FLOOR home with NO steps. And you'll be basking in the Florida sunshine with a Margarita in hand because your heated pool is right outside your door!! Your fabulous, NEWLY designed and furnished home is located in the gated, highly sought after Villas at Island Club resort in the upscale Lindfields area of Kissimmee, and has it ALL! NEW high- end Therapedic mattresses in every room designed to give you the best night's sleep you've had in years! Need to catch up on some work or wish to have breakfast by the bed? We've given you a cozy table and chairs for that as well! The children will absolutely "flip" for their room - two twin beds designed in "Mickey Joins The Navy" decor, and their own wall-mounted flat screen TV! You'll also enjoy the best resort amenities anywhere: A wonderful HEATED pool just steps from your door, tennis, volleyball, a clubhouse with a fitness center, BBQ's and picnic tables, and more. Disney World and Universal / Harry Potter are just 5 minutes and 15 minutes away, respectively. Theme park tickets - NO ONE will save you more money on all your theme park tickets! We've been saving our families more money than anyone else for years and we'll do the same for you! FREE use of our baby ware - save on rental fees! AND RATES THAT ARE SO LOW, YOU WILL ABSOLUTELY WONDER HOW WE DO IT. See you at the Mouse House!